Looking for a free comment card template? It's time to give up on comment cards. Even if you could get your comment cards for free, they hurt more than they help. At each step in filling out a card, people will fail to go to the next step. So for each step or hindrance along the way will result in a severe drop-off in numbers of cards you will receive. Some folks will not give you their address because either they want to be anonymous or they are afraid you'll send them junk mail. Requiring their name and address will lead to the customer scrapping the card. If the customer is anonymous, you have no way to respond and assure them you will fix the situation, therefore no way to fix the relationship with that customer. Comment cards do allow you to discover problems to fix, whether the problem is with the facility, service, or product. Once fixed, future patrons will have a better experience. But for the customer that wrote it, the experience and first impression were flawed. It's too late for them, especially if you're waiting until shift change to read cards. In short, comment cards fix the future, not the present. 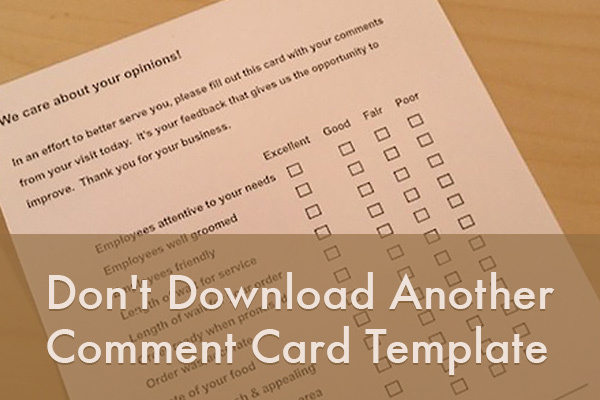 If your comment cards are in a kiosk next to the salad bar, condiment stand, or hostess station, it's most likely your customer won't see them, and therefore won't use them. Out of sight, out of mind means that the customer will leave, taking their opinions with them, and off to Yelp, Facebook or wherever they prefer to complain. The real insult is if they are sitting in your establishment writing that bad review from their smartphone. You can dump comment cards and use our awesome solution, which actually makes commenting fun, quick and easy, as well as anonymous (but with the ability for management to respond).